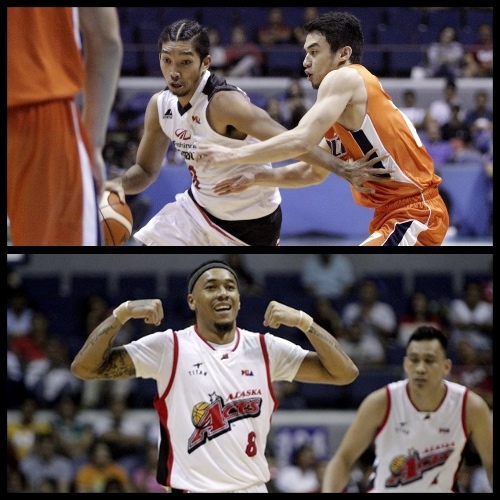 Wednesday action in the 2016-2017 PBA Philippine Cup was hot as Mahindra tripped up Meralco and Alaska outlasted Star. The Mahindra Floodbuster made it back-to-back wins after a sizzling shooting performance against the Meralco Bolts in a 105-92 win in the Oppo PBA Philippine Cup on Wednesday at the SMART-Araneta Coliseum. Philip Paniamogan was red-hot for Mahindra, scoring 25 points on 9-for-11 shooting from the field. He made his first six three-pointers of the game and finish 7-for-9 from beyond the arc in a terrific offensive performance. Alex Mallari had a double-double, tallying 13 points and 11 assists alongside six rebounds while Jason Deutchman and Nico Salva each added 13 markers as well. The Floodbuster, as a team, made 21 three-pointers on 47 attempts for a 44-percent clip. Alex Mallari (MAH) - 13pts, 6rebs, 11asts, 1stl, 1 triple. Reynel Hugnatan (MER) - 28pts, 6rebs, 3asts, 1blk, 3 triples. The Alaska Aces got some big plays from Calvin Abueva as they defeated the Star Hotshots, 97-90, in overtime of a tough Oppo PBA Philippine Cup encounter on Wednesday at the SMART-Araneta Coliseum. Vic Manuel scored 25 points and grabbed eight rebounds in a big performance while Abueva had some standout moments en route to 23 points, nine rebounds and four steals for the Aces. ‘The Beast’ hit a big three-pointer late in regulation and even bucked an injury scare as he scored five of the first seven of Alaska’s points in overtime. Calvin Abueva (ALA) - 23pts, 9rebs, 2asts, 4stls, 1blk, 1 triple. Allein Maliksi (STA) - 15pts, 9rebs, 1ast, 3 triples.